Fall is definitely in the air … on the internet … and in my kitchen! One of the best things about Fall is all the pumpkin goodness. I am not gonna lie, Spring may be my favorite season (I love watching the flowers bloom and the weather seems perfect) …. but by far, Fall has some of my favorite foods and flavors – and is a close second in terms of my favorite season! I learned a very valuable lesson earlier this year – apparently they don’t stock canned pumpkin year-round at our local Wally World .. or any other store here in Eastern NC for that matter. I have never lived in such a place. I went to buy canned pumpkin in February of this year and was told “it’s a seasonal item” …. really?! This year I am stock-piling it like it’s nobody’s business. I will not make the same mistake twice. 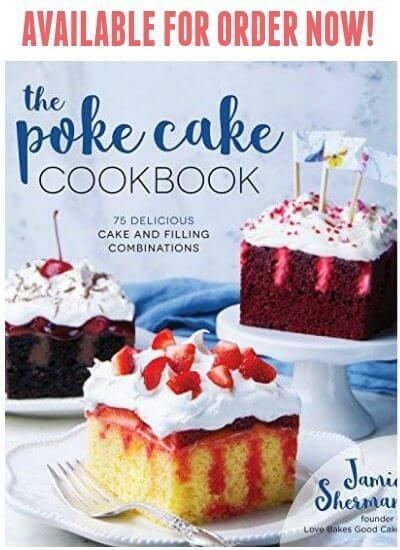 Poke Cakes are not new to the scene …. they’ve been around for awhile. 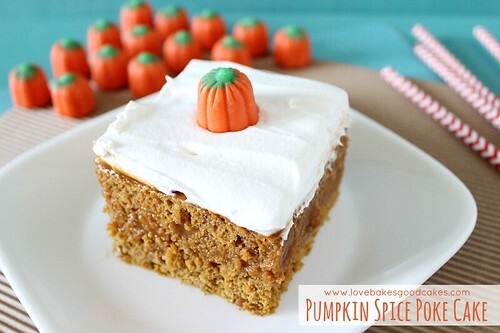 I’ve seen tons of variations, but I’ve never seen a Pumpkin Spice Poke Cake …. and that’s exactly what I’m sharing with you today! If you love pumpkin and spice, you are going to *L*O*V*E* this cake. It’s like eating pumpkin pie in cake form!! Soooo good! Oh, and if you live in a weird place like Eastern NC, where they don’t sell canned pumpkin year-round, you might wanna stock up too …..
Spray a 9×13-in. baking pan with cooking spray and set aside. Place the cake mix, pumpkin and eggs in a large mixing bowl. Mix on low speed with an electric mixer for 1 minute. Stop the mixer and scrape down the sides of the bowl with a spatula. Mix on medium speed for another minute or two or until the mixture looks well combined. Pour the batter into the prepared pan. Level out with the spatula. Bake for 30 minutes or until toothpick inserted near the center tests clean. Remove from the oven and allow to cool while you prepare the pudding mixture. Using the handle part of a wooden spoon, poke holes in the cooled cake. There is no set number of holes, but you want plenty of nooks and crannies for your pudding to fill. In a large mixing bowl, combine the pudding mixes and milk. Whisk until the pudding mix completely dissolves. Pour the pudding over the cake – filling the holes as best you can. Level out the pudding and gently push pudding into the holes to fill. Cover your cake pan with plastic wrap and refrigerate for about 2 hours or until the cake has cooled completely and the pudding is set up. Remove the cake from the refrigerator and spread the whipped topping evenly over the top of the cake. If desired, top with pumpkin candies to decorate. I want to try this cake but I am having a difficult time finding the pumpkin pudding. Have to keep looking. Yes, I found mine at Walmart! I hope I can find Pumpkin Pudding, I will keep looking. If I make this I will feature it on my blog. Oh my gravy. I want this cake! It looks absolutely delish, Jamie!! 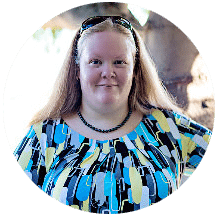 Thank you for linking up at Tempt My Tummy Tuesday. This cake looks so yummy! LOVE poke cakes! Great recipe and I'm wondering where I can find the pudding? I found mine at Walmart! I agree about Fall food/flavors. Nothing beats it. I bet this cake smelled absolutely wonderful while baking. Thanks for linking. That's crazy that you can't find pumpkin year round at your store. I would stock pile too! Looks delicious and I love those pumpkin candies. I don't know why but they taste better to me than candy corn even though they're pretty much the same thing. Yum! You're right…last year, I resorted to making my own pumpkin puree because it was no where to be found! You better bet I pick up at least three cans every grocery trip now ! Thanks for sharing at MTM! Jamie, we will just love this cake! Thank you so much for sharing your awesome recipe with Full Plate Thursday. Hope you have a great weekend and come back soon! This sounds delicious. Wish I could find that pumpkin spice pudding here. I'd love to give the recipe a try. I love how simple this cake is and so seasonal too. thanks for putting it up on foodie friday. Nuce twist on pumpkin cake, Jamie! Thanks for sharing on Foodie Friends Friday! WOW, that looks so yummy! I love this time of year! Looks beautiful AND delish!! I can't believe NC doesn't have canned pumpkin year round? You should move to VA! 🙂 Thanks for sharing at Foodtastic Friday! So glad you linked up! 🙂 Added to the pumpkin board on Pinterest – can't wait to try this! WOW! Pinned. Might have to make this for Thanksgiving!!!!!!!!!! 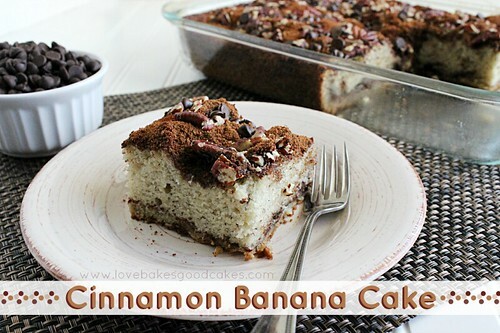 This looks so moist! I seriously LOVE poke cakes! Great recipe, Jamie! Thanks for sharing! This looks amazing Jamie! I love a good poke cake and I love pumpkin this time of year. This has both! Yes, please! This looks delicious! Stopping by from the Recipe Sharing Monday hop. Definitely trying this one over the weekend. I also cannot find that flavor of pudding in Charleston SC. Anyone close to here know where I can find it? I found mine at Walmart in the seasonal baking section. I hope that helps! Oh wow, this looks amazing! Thank you for sharing at Simple Supper Tuesday. 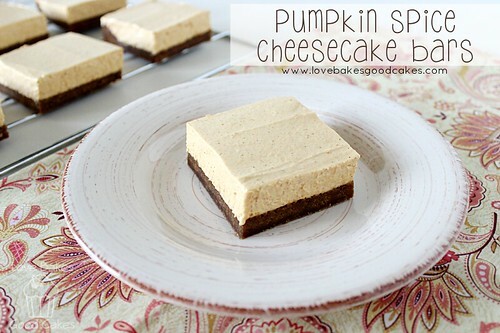 Pumpkin lovers rejoiced with this recipe Jamie! I'll keep and eye for that pudding over here and share it with my family in the coming holidays, thank you for joining us at the Fluster Buster Party. Hi Jamie!! I love this cake!! It's perfect for the holidays! I'm adding this recipe to my Special Cake & Pie Recipes for the Holidays Round Up. It's going live tonight!! That is crazy that you can't get pumpkin year round! Isn't that the point of canning things? Speaking of crazy, this cake looks crazy good! I love pumpkin spice, so this baby is right up my alley! My hubby loves poke cake and pumpkin. This is a must-make for us! What a yummy looking dessert Jamie! I love pumpkin everything!! I thought for the longest time I didn't like poke cake, but I tried one recently and loved it! This flavor sounds delicious, Jamie! What can I use for pudding as our Walmart doesn't carry it?